The last time I had visited Papakura was 2009. Last week, I had cause to visit it twice -- the first time, on Tuesday, for a sanity break (which was the reason, oddly enough, why I visited Papakura three years ago, hoping for a break for a bit from history stuff -- ah, well, that was the hope! ), and the second time, three days later, to present a talk on Chinese history in Auckland to the local Probus Club. For me, Papakura is nearly 80 minutes of train travel from Avondale, plus waiting time at Avondale and at Newmarket stations. But -- for me, fond of rail transport as I am, that's a bonus. The time is worth it. At the end of the train journey to the south of Auckland City, with only Pukekohe further on, I found Papakura to be a laid-back sort of place. Much like parts of Rotorua and Matamata in that respect. Excellent stuff for frazzled urbanites like myself. There is still some of the rural countryside spirit in Papakura, and on both days I was made to feel extremely welcome. March 27, by the way, the Google Streetview car was out and about. Hardly surprising, as the last time they took shots of Papakura, it seems to have been raining. This time, hopefully, that car with the strange ball of camera lenses sticking up on a pole attached to the roof got one of my favourite parts of Auckland on a truly grand day weather-wise. Wood Street curves out from the train station's exit, and is probably the main way towards Great South Road and the shopping centre. Alongside Wood Street, sitting on Central Park, is the old Papakura School building. According to the history of the school (copies available from the Papakura Museum, by the way, where I bought mine), the first part of the building dates from October 1876, extended with a porch and fireplace in 1879, a further classroom in 1902, then two further classrooms in 1913, designed by Mitchell & Watt (Auckland Education Board architects at the time). Theirs is the dominating style. John Farrell, another Board architect, designed another classroom addition in 1918. A separate infants block was built next door in 1924 -- you see this first on the park as you walk from the station. Even the road itself has changed over time. Simms tells us that it was once called Union Street. As for the school itself, it was: Papakura Free School (1877), Papakura School, Papakura State School, Papakura Primary School (1880-1939), Papakura District School, Papakura Central School (1940-1947), Papakura Normal School (1947-1957), Papakura Central School (1957-1972). A new school was built on Ray Small Drive, on the site of saleyards on former Cook Street, and the old school was closed in 1973. Forty soldiers from Papakura Military Camp gave the old building a facelift in 1978, and in 1987 it was leased by the local District Council to the Papakura District Community Arts Council as a Community Arts Centre. Just across from Central Park, the Papakura War Memorial, at the junction of Great South and Opaheke Roads. The surrounds today are a far cry from those at the memorial's unveiling in 1921. From page 19, Old Central School, Papakura 1876-2000. 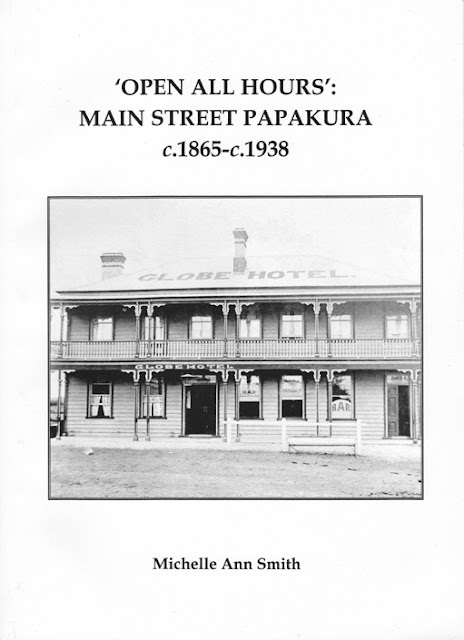 Possibly from Papakura & Districts Historical Society archive. 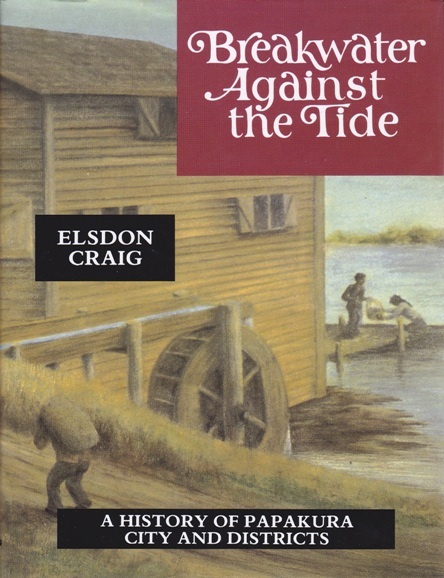 According to Elsdon Craig's book, Breakwater Against the Tide (1982, reprinted 2008), pp.152-153, a young local named T S McFarland sculpted the memorial with a composite uniformed soldier and crouching lion. The memorial was unveiled by Admiral Lord Jellicoe, Governor-General of New Zealand. Fellow blogger and historian Helen Vail, in 100 NZ WW1 Memorials, has covered two of those included on the memorial: Lance Corporal William Fred Derbyshire, and Roy Alexander, DSM. The memorial also includes plaques for those who served in World War II, Malaya, Korea and Vietnam. This is very cool, as far as I'm concerned. Set into the pavers at the corner of Wood Street and Great South Road, six plaques creating a map for visitors (like me) so we know how to get about. Excellent stuff -- more of these should be in other places in the city. Late in 2010, the efforts of the outgoing Papakura Council came to fruition with the opening of the combined Papakura Museum (operated by the local historical society) and the Sir Edmund Hillary Library, in an easy-access building off Great South Road. Another fellow blogger, Claire at A Latitude of Libraries, has covered info on the library already. The museum, though, is worth a visit. "Feeding birds on the lawn at Mrs Chamberlin's homestead, Drury." Auckland Weekly News, 24 September 1903, ref AWNS-19030924-1-4, Sir George Grey Special Collections, Auckland Library. One of the images on display was this (above). Egad, I thought, not more ostriches! Back in 2009, when I visited the museum in its previous incarnation, I bought a lot of books. Actually, I'd say that the Papakura Museum is either a good place or a bad place for local history book addicts such as yours truly, depending on the point of view (and how much money is left in the bank). I didn't buy the book above ($35 for the 2012 second edition), but ... I bought the school history, and these. This was around $30 as I recall -- check with the museum. I thoroughly recommend it as a great and detailed history of the local shopping precinct. I feel other studies of the type should model themselves on this. As for this -- a classic, reprinted in 2008. And as for these in the foyer outside the library and museum -- I thought I'd left the sheep behind at Mangere? And, why is the one on the right apart from the others? The sheep keep their secrets, though. I may never know. Update: My favourite taphophile, Sandy, has added value to this post (thanks!) 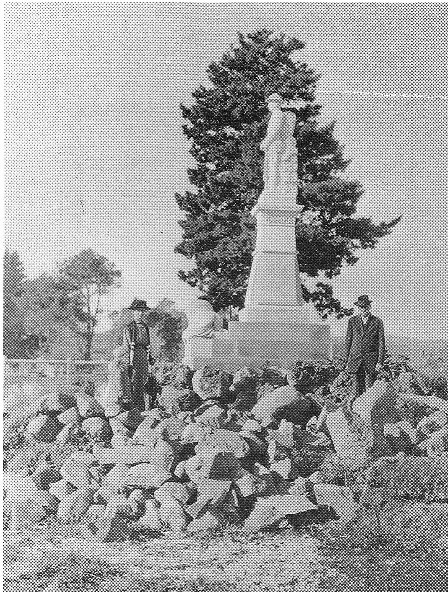 with these links from her comment below: her collection of photos of Papakura Cemetery, including the grave of the saviour of prostitutes, and a survivor of the 1886 Tarawera eruption, and Papakura South Cemetery. You have been followed by one of those Mangere sheep! Great images great post loved this! LOL the sheep are brilliant! Nice post Lisa. I was in Papakura last weekend also :) Been there a couple times now...cemetery trawling of course. Adding graves slowly - have so many more to add. Aw, you're too kind, both of you! I've added the Papakura Cemetery and Papakura South Cemetery collection addys as live links above, Sandy. As per usual -- you have blown me away by your photography, and the nuggets of information you've found to put with your images. Cheers! Mrs Chamberlin's homestead sure is cute. I wonder if it still stands? Apparently it does, Darian. The historical society folk showed me a photo of it from last decade. Dream house! (depending on its current condition). Did this museum have any kind of general store slash food and drink packaging display (besides the Wai-Wai Lemonade cart)? Unfortunately, no. But then, the museum doesn't display all the stuff the society has accumulated over the course of its 50 years. Something like that would be cool. Otahuhu Historical Society do have a bit of a display of grocery items from the past in their rooms, as I recall. I have just been reading your blog page about your visit to Papakura. I noted in the questions at the bottom that Darien was asking about the Chamberlin homestead. As I am not a blogger or have a google account, I was unable to post a reply so thought I would send this to you. I really enjoyed reading your blog. Incidentally, the book ‘Open All Hours’ was $10 and Breakwater was $30. T S McFarland was my grandfather. He was a gifted artist and took immense pride in creating the Papakura War Memorial. It was a especially poignant to him as he lost his brother and 2 close first cousins during the War.